The movies seemed bent on keeping Boris Karloff in Victorian garb for the final decade of his life. But two novice directors — at a time when Karloff had only two years left on the clock — had other ideas, and plopped the elderly actor into the present day, with happy results. 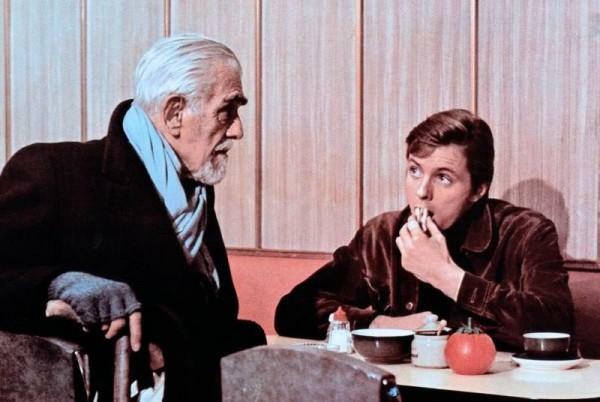 Boris Karloff has a proposition for Ian Ogilvy in Michael Reeves’ “The Sorcerers” (1967). 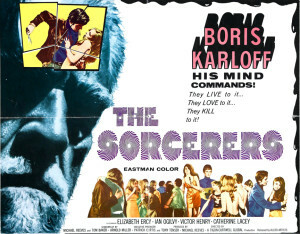 Michael Reeves, then 23, cast Karloff, then 78, as a marginalized senior citizen hobbling along the periphery of London’s youth-obsessed nightlife scene in “The Sorcerers” (1967). Peter Bogdanovich, then 28, cast Karloff as a fed-up horror movie star in an ugly contemporary Los Angeles in “Targets” (1968). 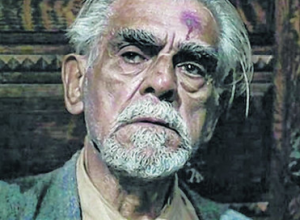 The actor had one lung, emphysema and wore two leg braces — walking was clearly a torture for him — but performed gamely for his young collaborators. After “Targets,” Karloff squeezed in five more movies, two TV roles and at least one commercial, and died on February 2, 1969. In “The Sorcerers,” he plays Prof. Marcus Monserrat, a disgraced hypnotist living in virtual poverty with his washed-out wife, Estelle (Catherine Lacey). Besides the couple’s cheerless small talk, the only sound heard in their cramped flat is a ticking clock, a mocking reminder of their dwindling days on this planet. What follows is a bit hard to swallow, even for a genre film: the Monserrats use their fancy equipment to mind-meld with the boy, and they experience his physical sensations. (If he breaks an egg in his hand, the oldsters feel the dripping yoke in theirs.) Estelle craves bigger and bigger thrills, while Marcus wants to tread lightly. Thus, a battle of wills ensues. It’s kind of like a long, color “Twilight Zone” episode with a 1960s British sensibility. There is superb chemistry between Lacey — who played a nun for Alfred Hitchcock in 1938’s “The Lady Vanishes” — and Karloff. Handsome, somewhat snarky Ogilvy is an ideal representative of disaffected youth in groovy London in the mid-to-late 1960s. Susan George, four years prior to “Straw Dogs,” has a small role. The music by Paul Ferris (who scored all of Reeves’ movies) is spot on — unconventional, appropriate and somehow sad. The rock band in the nightclub scenes isn’t quite the Yardbirds, but the guys look and sound authentic to the historic music scene. Reeves’ storytelling style is straightforward and sophisticated; he weaves in themes of voyeurism, isolation and that terrible phenomenon of old marrieds who turn on one another. Reeves’ apparently bright future was snuffed out when he died of an accidental barbiturate overdose at age 25 — only nine days after Karloff’s death.